Our brains learn through stories and as long as we are living, we never stop learning. The way we were taught stories from birth helps to shape the way we see and understand the world. When we experience new things we try to ground these new experiences into our familiar stories. As we hear stories from family, friends, and community, we incorporate these stories into who we are and then we retell them. As faithful Unitarian Universalists we must do our best to stop repeating the stories that are most resonant and consistent with the dominant culture. What we should really be striving for is a new way of being and a new narrative. First, we need to acknowledge that stories prevent us from thinking differently and then, in the process of forming our beloved community – one that is multicultural, multiracial, and multi-generational – we need to craft our new stories. A transformative learning experience is an experience that causes you to question what you know. Adults can question their thinking, their stories, and they can consciously create new stories and seek transformational experiences. When we experience a disconnect between what we know and understand, we grow. At the UUSA we use spiritual practices to help us to accept and welcome the discomfort that precedes transformative learning. The Adult Education programming is being developed based on requests and also on volunteer interests. 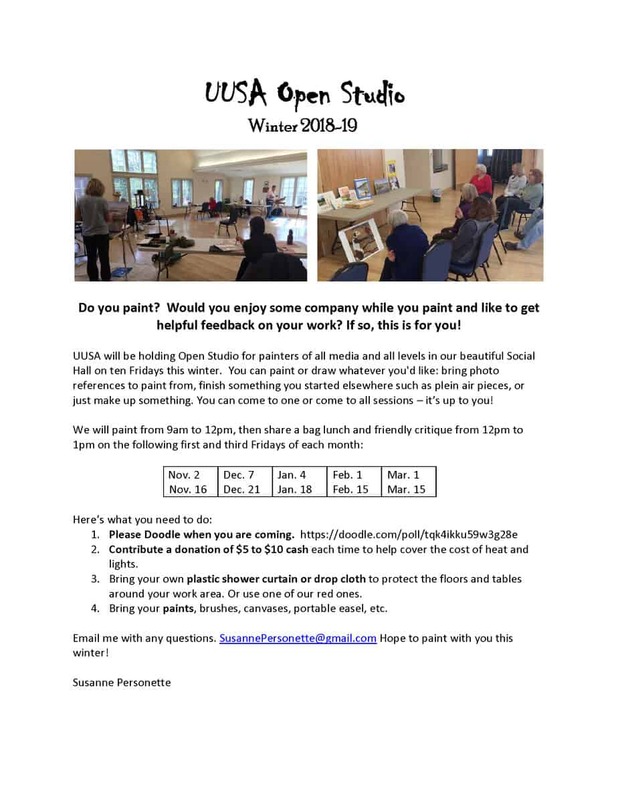 If you have an interest that you would like the UUSA to explore in a small group learning format please contact the Director of Religious Education, Rebecca Fricke. New to Unitarian Universalism or the UU Society of Amherst? We invite you to join us for a brief Getting to Know UU class. This class is designed to help you understand a little about our history, shared principles, and traditions. Whether you are new to UU, or just new to the UU Society of Amherst, we want you to feel at home here. There is no pressure or expectation regarding joining. This is just a way to get to know you, and help you get to know us. Child care is available upon request and there is no cost. You can sign up at the Welcome Table after the Service. Making art is a powerful way to access, express, and share one’s inner light. And making art together strengthens that light so it can burn even brighter in the world. Come make your art with other UU artists at our Winter Open Studios! We gather on the first and third Fridays of each month from November through March in the Social Hall from 9 am to 1 pm. For more information, contact SusannPersonette@gmail.com.